Here are several views of a war time German Hetzer, taken in England after it was captured. These shots are of our Hetzer, taken at various events in Texas. The photo on the left was taken at an open house held at Camp Mabry, where our Hetzer is housed. The center photo is taken from a page of the German driver's handbook. It shows the rear wall of the fighting compartment (not the entire wall is shown). The photo on the right is taken from the Swiss manual on the 7.5 cm Pak 40, the gun mounted in the Swiss G-13. It shows the major components of the gun and is similar to the mount used in the German Hetzers. Two more photos of Hetzers in England. 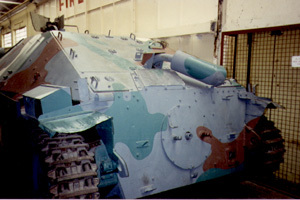 The first is from the same group of photos shown above, while the color photo is of the Hetzer on display at the Bovington Tank Museum in England. I am unsure if they are in fact the same vehicle, since the color photo clearly has a different paint scheme (which appears incorrect for war time Hetzers), evidently a recent paint job. The entrance to the Texas Military Forces Museum, home of our Hetzer, located at Camp Mabry in Austin, Texas.